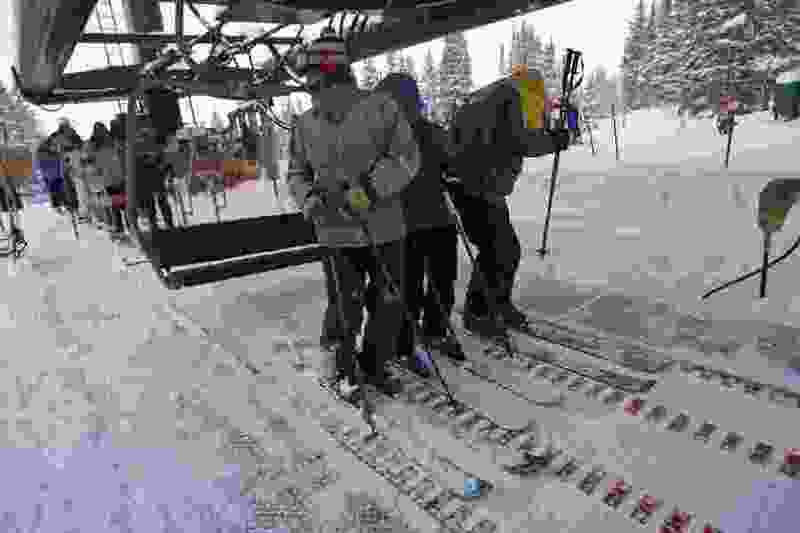 (Chris Detrick | The Salt Lake Tribune) Skiers slide forward on a conveyor belt that eases loading onto the Supreme chair lift at Alta Ski Area. There’s no doubt that the proposals included in Alta’s Master Development Plan just approved by the United State Forest Service threaten to overdo it. Most egregious of the proposed projects is Alta’s plan to place a new tram on Mt. Baldy. Baldy is one of our most iconic peaks in the Wasatch. Allowing for a new 150-person-per-hour tram to connect with Baldy raises a host of concerns, including changing the character of the canyons, undermining existing ridgeline protections, the impacts of additional infrastructure on fragile alpine environments, to impacts on wildlife and botanical resources. As a resident and Salt Lake County councilman, I’ve dedicated myself to stewarding these canyons. Most recently I strongly supported the council’s revision of the Foothills and Canyons Overlay Zone. The council labored for months to find the correct balance between development interests, population pressures, watershed integrity and preserving aesthetic beauty. A central issue of the revision was the importance of limiting development to already disturbed areas and keeping viewsheds and ridgelines intact. The proposed Baldly Tram, which will be visible from nearby peaks across the Wasatch, will degrade our scenic viewshed, one of the qualities identified as being of the highest importance to residents of Salt Lake County. Further, with the Forest Service’s granting Alta’s request for the tram, there are no provisions stopping Alta ski lifts from further developing the summit of Mt. Baldy. Alta has refused to limit themselves from developing further infrastructure on Baldy. It’s entirely possible, if not likely, that Alta, feeling the pressure of neighboring ski areas and a desire to stay current with competitors in the ski market, will soon feel the need to cap Baldy with restaurants or conference space. In addition to degrading the viewshed, the proposed Baldy tram will forever negatively alter Alta’s character. Baldy has always been a place where a little bit of labor spent climbing paid off with relative solitude and extraordinary backcountry runs. Crowding this summit with a tram and 150 people per hour will degrade this experience enjoyed by so many generations and strip this experience from future generations. Alta, in making its decision to place a tram on Baldy, is ignoring the potential harm to American pika which are found in the area. Given the absence of the American pika being mentioned in the environmental assessment and USFS decision, a further review and study of the impacts of additional development of high alpine summits in the Wasatch is warranted. Twice, petitions have been made to grant endangered status to the American pika, a small rabbit-like creature disappearing from the West. While both petitions were denied, it can be reasonably assumed the strain which climate change is putting on high alpine populations of plants and animals may be sufficient to justify listing pika in the near future. Decisions such as this to increase development in their fragile, and rapidly warming habitat, may just assure the species listing in the future. Alta is a world class ski resort because the terrain and surrounding mountains are some of the most beautiful in the world. This scenic beauty is matched by the allure of Alta’s rustic character. Alta’s proposal and the Forest Service’s recent decision threatens both the environment and beauty of Little Cottonwood Canyon. Sadly, future generations will not know the Alta experience, it will only live on in the hearts of those who were fortunate enough to have been there before the trams and infrastructure became more important than the beauty and character of this place. Jim Bradley is an at-large member of the Salt Lake County Council.